Building an Office Bike Rack for $30. 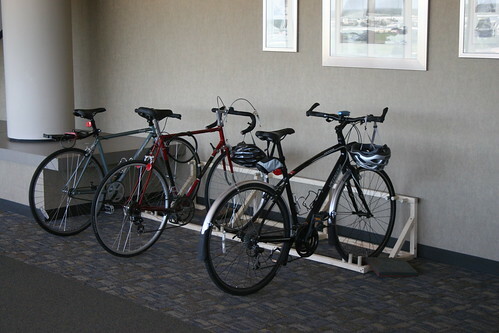 So, one day I found some bike racks in part of the office I seldom frequent. There were three following a similar design. A right triangle frame extruded along a wall with some pegs to hold the tires. I tried to take the best aspects from each. One had a good, strong frame. 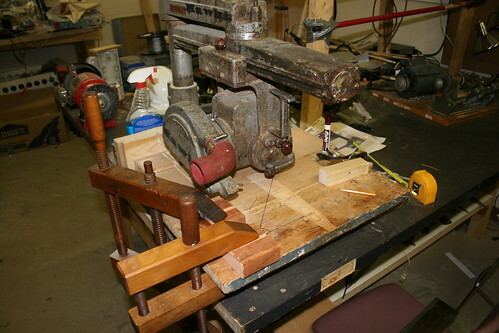 Another used wooden dowels to hold the wheels. The last fit two sizes of bike in the same slot. To start, I used 5 sections of 8 foot 2x2 lumber. Three of these go directly into the frame, so pick the straightest ones. Next you'll need 4 20 inch sections, 4 14 inch sections, and the remaining lumber makes 4 pieces cut as trapezoids to form the hypotenuse. If you're careful you can get all of those from the last 2 pieces of 2x2. 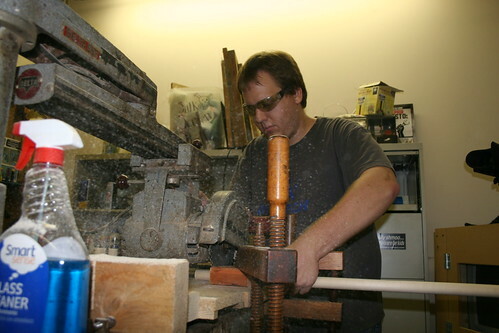 Once the dowels are sliced, screw them to the frame. I started with a pattern of six so that along one rail it goes dowel - space for a mountain bike - dowel - space for a road bike - dowel. Eventually I intend to attach more of the dowels to fit different sizes of tire, as well as fill in all the spaces on the rack as it currently only fits three bikes.